Natural Stone Flooring, Granite, Slate. When you think of the word �traditional� and then associate it with a bathroom, you may think of an old-fashioned, dull bathroom. However, this is not the case here... traditional taps help to create a classic, yet lively atmosphere to your bathroom. Traditional taps add elegance to a unique bathroom, with beautiful curves and fine detail. Steel baths are the most strong and robust bath to have � they are stronger than iron, plastic and marble too. Because these baths are thick and tough, they do not loose warmth easily � they keep heat and let you wash in warmer water for longer. This means that they are cost-effective bath to have. Additionally, they keep their colour too, and they do not get any damage from household products. Acrylic baths, like steel, are very tough. Acrylic baths have a non-porous surface; they do not harbour any germs too. The surface of this bath is easy to maintain and clean and requires little effort. Acrylic baths are slightly more modern than steel baths, and are excellent quality when compared to the cost. Many people get confused or mixed up between the electric and power shower. The electric shower works by quickly heating the water as it flows towards the shower head. The electric shower give outs water, without the need of a pump. Power showers give a refreshing experience and they offer the user to change the pressure of the water flowing through the head of the shower. When you are fitting a new bathroom there is a lot of different things that need taking into account in order to ensure you have a practical yet attractive bathroom. When you are wanting to install totally new elements to your bathroom, including baths, shower enclosures, walk-in showers and sinks, it is essential that you plan out where each new aspect of your new bathroom will go. One issue you may find at a later date unless you plan ahead is that although you have fitted in all your bathroom features you wanted you have a bathroom which is awkward to move around in as there isn't enough space around each feature. One of the first tasks to be completed when forming a bathroom of your own is how much space you have available. Often if you have a small bathroom you will find that you will not be able to install all the aspects you may have wanted, however there are solutions to this such as an extension or bringing two rooms together to create a larger room. When fitting your bathroom you will need to ensure there is both room for the feature plus additional room in front to easily use it. Sometimes you may have to concede on certain parts or find a smaller option as features such as shower trays and baths can come in a range of different sizes. For shower enclosures we think it is best to leave an area in front of the enclosure of the width of the shower tray by about 40-70cm. The amount of room you give yourself is often a personal preference, however for showers with doors that open outwards you will need to take into account there needs to be room for the door to open as well as room for you to stand which is especially important if you are planning on using a hinged shower enclosure door. For sanitary basin sets we generally find the best dimensions for the amount of space that should be left is around 100cm by 70cm. If you are wanting to have a cabinet under the sink it is often best to leave additional space to easily open and close the doors as you stand in front. If you choose to have a brand new bath fitted we advise that you leave an area of around 70cm by 110cm next to the bath in the space from where you will enter and exit. 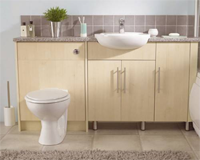 If your bathroom is going to have a toilet we advise you leave a space of 80cm by 60cm in front for ease of use. As with many bathrooms to save space you can cross over the areas you have left in front of each feature, however there are some exceptions such as a his and hers bathroom sinks as you will need an area for both of you to stand. Other things you will want to take into account when planning your new bathroom is the positioning of your current plumbing, the space required for your bathroom door to open and will you have to move any vents or extractor fans. Is your current plumbing in the right location? Make sure there is room for your bathroom door to open. Make sure to take into account vents and windows. People always seek to impart harmony to their surroundings. Given the choice of available ideas, achieving harmony in bathroom design is very much a question of reduction to essentials - even though harmony should never be confused with blandness. The bathroom has become more and more important as a feature to the home and there are many ways in which improvements can be made. Attention to detail can be very rewarding and need not be expensive, local Cornwall trades people can offer excellent value for money and may help you create that dream bathroom without the nightmare price. Take a look at local trades people in the Cornwall area for all your bathroom requirements.